​This postcard will be delivered by mail to multiple Albuquerque neighborhoods this weekend. The University of New Mexico is a publicly funded institution and the community deserves to know who is responsible for UNM’s radical abortion agenda. *UPDATE: OF ALL OF THE POSTCARDS WE’VE DROPPED THE BATTLE WAS ON TO DROP THIS ONE! Albuquerque, NM- Earlier this month we shared news stories announcing some abrupt changes at the University of New Mexico with regard to the Health Sciences Center board being dissolved by the UNM regents. In 2010, when we moved to Albuquerque this governing board was brand new, and it placed Dr. Paul Roth in a position of incredible control. 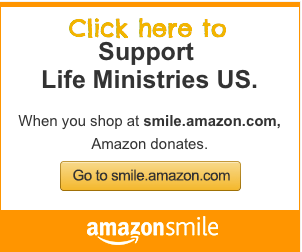 For 5 years we have been exposing and applying pressure to those with the ability to end the abortion agenda at UNM. 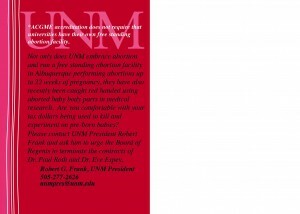 Whether the motivation for change at UNM was rooted in money, a new hospital or damage control due to Paul Roth’s leadership…It is hard for us to ignore the fact that UNM is currently under a congressional investigation regarding the use of fetal tissue and it’s abortion agenda has become widely known during Dr. Paul Roth’s tenure. 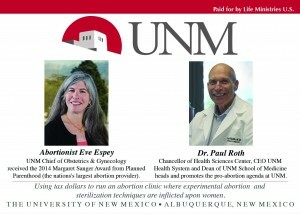 It seems as though UNM leadership is moving in the right direction in order to make substantial change, however, Dr. Paul Roth is still the motivating force behind their radical abortion agenda. As Dean of the School of Medicine Roth was the highest authority in giving abortionist Eve Espey the promotion to Chair of the Obgyn department, even though her agenda is to promote abortion here and abroad. Espey also received the Margaret Sanger award in 2014. In order for UNM to completely abandon their pro-abortion agenda, a few things must be done. Roth and Espey must be terminated and now President Frank has the authority to bring the matter to the Regents for their approval. We are asking the public to contact President Frank and ask him to urge the regents to terminate the contracts of both Espey and Roth. Please contact UNM President Robert Frank and ask him to urge the Board of Regents to terminate the contracts of Dr. Paul Roth and Dr. Eve Espey.